While the agency of individuals has been identified as a key factor in triggering governance transformations in social-ecological systems, more research attention is needed on how the social position of the actors involved influences these processes of change. Here, we highlight how the unique position of Indigenous women in a recent fishery conflict brought strength to this resource struggle and led to changes in the management of Pacific herring (Clupea pallasii) on the Central Coast of British Columbia, Canada. Through 18 semi-structured interviews with Heiltsuk women and men involved in this fishery conflict, we identified important actions taken by women in the community, which contributed to advancing the preconditions for transformation of the existing governance system. Heiltsuk women took on key leadership roles, increasing social cohesion, facilitating the flow of information, and negotiating among those holding power and conflicting objectives. Viewed through the framework of transformative change in social-ecological systems, women demonstrated strategic agency in challenging colonial governance regimes and catalyzing change. We relate these findings to theoretical understandings of women in environmental justice movements and activism and underscore the importance of Indigenous women as agents of change in their communities and as important actors in fisheries governance transformations. These leadership roles must be recognized and supported to navigate towards natural resource sustainability and social justice, globally, as well as reconciliation for past injustices, nationally. Scholars interested in understanding social-ecological systems have identified the agency of individuals as a key factor in the transformation of systems towards more sustainable futures (Westley et al. 2013; Moore et al. 2014). While there has been increasing critical engagement with understanding the role of power and agency in social-ecological system transformations (Walker et al. 2004; Olsson et al. 2006; Folke et al. 2010; Gelcich et al. 2010), this literature has not fully considered the positionality of those involved in these transformations. Positionality refers to one’s location within the larger social structure (e.g., gender, race, class), and is key to how people experience, articulate, and respond to environmental struggles (Polido and Peña 1998). Intersecting identities such as gender, race, and class influence how people are uniquely situated in these struggles, and adopting an intersectional lens to highlight the unique positionality of those involved in fostering transformations can offer important insights into these processes (cf. Staeheli 2004). To explore how positionality influences governance transformations within social-ecological systems, we look at a recent fishery crisis and conflict that led to a shift in the management of Pacific herring (Clupea pallasii) on the Central Coast of British Columbia, Canada. In this example, we examine how Indigenous women responded during this crisis and conflict and argue that these uniquely situated women played an essential role in creating and advancing the preconditions for a governance transformation. We then discuss these findings as they relate to existing literature on women’s roles in environmental justice movements (Pardo 1990; Bell and Braun 2010) and gender dimensions of resource governance (Westermann et al. 2005; Pandolfelli et al. 2008), with particular attention to the role of Indigenous women (Udel 2001; John 2015). Through this examination, we add novel dimensions to our understanding of these transformation processes—in ways that draw attention to care, equity, and intergenerational justice as impetus for resistance and change (John 2015; Harris et al. 2017). Struggles over access to and control of natural resources have long been a part of the socio-political landscape around the world; however, for Indigenous peoples and other marginalized groups whose livelihoods depend directly on the natural environment, resource conflicts often extend beyond the ecological to encompass issues of social, cultural, and economic inequality (Escobar 2006). For Indigenous peoples, whose access to resources has been severely constrained due to colonialism, these struggles are about more than just the resource itself, but about challenging the status quo, and reasserting power and authority (Escobar 2006). Women play a central role in challenging these unequitable patterns and injustices, often positioning themselves in these struggles as mothers and caretakers, defending the health and wellbeing of their children and future generations (Pardo 1990; Parisi and Corntassel 2007; John 2015; Harris et al. 2017). This positioning has been a source of strength in many environmental struggles. For example, female Haida Elders on Canada’s Northwest Coast were on the frontlines of protests on Lyell Island in the 1980s over the threats of deforestation and development in their traditional territories. These actions eventually led to the creation of the Gwaii Haanas National Park Reserve and a precedent setting co-management agreement between Canada and the Haida Nation (Jones et al. 2017). The present moment marks an especially critical period for Indigenous peoples in Canada with respect to the recognition of natural resource rights. With the election of a new, federal Liberal government in 2015, the signing of the United Nations Declaration on the Rights of Indigenous Peoples in 2016, and a formalized process of reconciliation under way (as part of the Truth and Reconciliation Commission of Canada), the Canadian Government appears committed to improving their relationship with what are named officially in the Constitution of Canada, “Aboriginal Peoples”: defined as the First Nations (peoples once known as “Indians”), Inuit, and Métis.1 This commitment to building stronger nation-to-nation relations between Canada and Indigenous peoples marks an important period for redefining fisheries governance systems with respect to Indigenous fishing rights. These efforts are key to ongoing efforts of First Nations in British Columbia towards self-determination, in particular because treaties were generally not signed in the province (with a few exceptions, making BC distinct vis-a-vis other parts of Canada), but also given the current reorientation towards reconciliation in terms of renewed relationships with Indigenous peoples in Canada. Negotiations by Indigenous groups over fishing rights began in the late 1800s as the provincial and dominion colonial governments began imposing regulations which restricted access by Indigenous groups to fisheries resources and economies and have been ongoing (Harris 2000). The recent struggle over herring along the Pacific Coast of Canada, including for Heiltsuk peoples of the Central Coast, has put further pressure on the federal government to negotiate and implement co-management arrangements with First Nations (Jones et al. 2017). While some recent progress has been made in enhancing the Indigenous fishing rights agenda (von der Porten et al. 2016), truly shared decision-making power is not yet a reality. However, the case study described here highlights an important shift where Heiltsuk women played a pivotal role in galvanizing the preconditions for a transformation in fisheries governance with important implications for the reorientation of Indigenous resource rights in Canada towards reconciliation. In the next section, we provide a brief description of the Heiltsuk-herring relationship, including some of the recent political and legal history, to set the stage for exploring the role of women and the changes they were able to effectuate in this recent conflict. Herring roe or spawn (thick layers of fertilized herring eggs) deposited on kelp or other plant material growing naturally near protected shorelines has long been a source of food, nutrition, trade, and livelihoods for Northwest Coast Indigenous peoples, including the Heiltsuk. Over millennia, some Pacific Coast groups such as the Heiltsuk also set out plant materials (branches or whole trees or specially harvested kelp) in open ponds. The Heiltsuk harvested herring spawn-on-hemlock and spawn-on-kelp using feather boa kelp (Egregia menziesii) for local consumption and traded the surplus with other First Nations. In the 1970s, a commercial overseas market developed for herring spawn deposited on giant kelp (Macrocystis pyrifera) hung in closed ponds ushered in state-imposed limitation policies and regulations. It was the only commercial fishery, for a short time, in which “Indian bands”2 and individuals owned the majority of the limited number of licenses issued. In the 1980s, the Heiltsuk Band with a single, community license negotiated yearly for increased access to the colonial controlled commercial spawn-on-kelp fishery in order to participate in this increasingly lucrative enterprise. However, the federal fisheries agency refused to issue additional licenses to anyone (Newell 1997). The Heiltsuk Band then in 1989 filed a law suit against the fisheries department for five licenses claiming an Aboriginal right. The federal court dismissed the case, in part because the government promised to issue additional licenses to First Nations, through a scheme that would largely fail. The Heiltsuk Band persevered in the struggle over access to the herring fishery. In 1988, two Heiltsuk Band members were charged with selling herring spawn-on-kelp without a commercial fishing license (Newell 1997). This case made its way to the Supreme Court of Canada, with the court eventually ruling in favor of the Heiltsuk. The resulting Gladstone decision (R. v Gladstone  2 S.C.R. 723) confirmed the constitutionally protected Aboriginal right of the Heiltsuk to harvest spawn-on-kelp (SOK) for commercial purposes (Harris 2000). The Gladstone decision increased fishing access and participation by the Heiltsuk, creating economic development opportunities in a community with high unemployment. While herring is of substantial economic importance to the community, its social and cultural significance make access to this resource by the Heiltsuk even more imperative (Bennett et al. 2018). Although the Gladstone decision was a major win in terms of the recognition of Indigenous fishing rights, it has been over 20 years since this decision and federal fisheries governance does not reflect court-established direction on the involvement of First Nations in fisheries decision-making processes. Low abundance of herring on the Central Coast led to a closure of the commercial sac-roe and SOK fisheries from 2008 to 2013. The following year, despite recommendations by First Nations for the fishery to remain closed for stocks to rebuild, commercial herring fisheries were reopened. This led to protests and litigation in 2014 and 2015 by the Heiltsuk and other First Nations (Jones et al. 2017). Then, in 2015, the controversial opening of the commercial sac-roe fishery led to a stand-off on the water, where two Heiltsuk women were on the frontlines, taking actions to protect their rights to conserve herring for their community and future generations. Following this stand-off on the water, a delegation of Heiltsuk women, Elders, and youth delivered an eviction notice to the local federal fisheries agency office, located on Denny Island in Heiltsuk Territory, resulting in a four-day occupation and lock-down of the fisheries office by the elected leadership. This political flashpoint prompted further negotiations between the Heiltsuk and the federal fisheries agency leading to a new, jointly developed herring management plan, adopted in early 2016. Then in January 2017, the Province of British Columbia and the Heiltsuk Nation signed a framework agreement for reconciliation, providing further grounds for power-sharing in the governance of fisheries resources. In this study, we bring together theories of governance transformations in social-ecological systems (SES) with insights from the literature on women in environmental justice and activism to examine how Heiltsuk women responded during a recent herring crisis and conflict to influence a system-wide shift in governance. First, we draw from the literature on transformations in governance, making connections to Moore et al.’s (2014) analytical framework for transformations in social-ecological systems and Westley et al.’s (2013) theory of transformative agency. Walker et al. (2004) define transformability as, “the capacity to create a fundamentally new system when ecological, political, social, or economic conditions make the existing system untenable” (p.1). Such transformations make use of crises as windows of opportunity for change, where novel and innovative strategies are combined with diverse experiences and knowledge in navigating these transformations (Folke et al. 2010). Westley et al. (2013) suggest that the agency of the people in a SES is a key component in processes of transformation. They employ the concept of institutional entrepreneurship as an explicit form of leadership to understand effective agency in complex systems. Institutional entrepreneurship differs from traditional, top-down leadership in that it is through the collective actions of individual actors (or actor groups), which, working together, build a common vision among stakeholders and mobilize the social capital needed to transform complex systems (Westley et al. 2013). We build on and extend the above concepts and theoretical understandings, combining this framework with insights related to the role of women in environmental justice movements and Indigenous activism, and the specific empirical considerations related to this case to examine what Heiltsuk women brought to this struggle and their role in transforming fisheries governance. Women involved in environmental justice movements at times have invoked notions of a “motherhood identity” or other attributes as motivation and legitimation for their participation (Udel 2001; Bell and Braun 2010). For Indigenous women, their traditional roles and responsibilities as mothers and caregivers go beyond their immediate households and families to include their communities and extensive kinship networks, as well as broader relationships with other non-human species and the natural world (John 2015). As a key example, Indigenous women leading and supporting the Idle No More movement in defense of Indigenous rights in Canada connected strongly to a sense of responsibility for the protection of all children and animals and plants, and emphasizing intergenerational care and equity (John 2015). While the ethic of caretaking and stewardship of land and resources is a core element of many Indigenous cultures (Brown and Brown 2009; Norman 2017), inclusive of all genders, the role of women as mothers and caregivers is often identified as providing motivation and strength for political activism, in addition to shaping their diplomatic strategies (Udel 2001; Parisi and Corntassel 2007; Grey 2010). The strength that Indigenous women bring to these struggles also often comes from traditional gender norms in many Indigenous cultures, including Heiltsuk, that hold women in high regard and consider them the backbone of their nations, as protectors of water, and other specific roles (Waterfall 1993; Whyte 2014; John 2015). In the Heiltsuk context, women’s traditional roles as teachers, disciplinarians, caregivers, and healers are honored and, as has been highlighted in other Indigenous cultures, these roles are viewed as essential to cultural continuity and survival (Waterfall 1993; Udel 2001; Whyte 2014). Insights for this study were informed by visits to the community of Bella Bella between March 2015 and May 2017 and focused on the events related to the 2015 herring crisis and conflict. During these visits, the primary author attended community meetings and demonstrations, co-led a herring science workshop, and conducted semi-structured, face-to-face interviews (n = 18). Questionnaires on cultural, economic, political, and social aspects of herring systems completed by participants during the workshop informed the schedule of questions for the interviews. Workshop and interview participants included men and women, with diverse perspectives and roles within the community from Elders to teachers, resource managers, hereditary and elected Chiefs, members of the elected Council, and participants in the herring fishery. Although there are some limitations associated with an extended period of data collection following a specific event, we were less concerned with specific details as we were with capturing what participants considered the most significant aspects of the herring conflict in terms of influencing change. The 18 interviews conducted over this study period, ranged from 15 to 60 minutes in length with most being audio recorded. For the interviews that were not audio-recorded, detailed notes were taken. All interviews were transcribed and digitized for analysis by the primary author to provide consistency. Finally, numerous archival documents were consulted for this study, acquired by special request from the Heiltsuk Cultural Education Center. Interview data, workshop questionnaires, and archival documents were analyzed using both deductive and inductive approaches, where initial categories and themes were drawn from pre-existing literature and knowledge, while other themes emerged from the data. Thematic categories included gender roles and responsibilities in Heiltsuk society and politics (Waterfall 1993), Heiltsuk laws and worldview (Brown and Brown 2009), and literature on social-ecological transformations (Westley et al. 2013; Moore et al. 2014), women in environmental justice (Pardo 1990; Agarwal 2000), and Indigenous activism (Udel 2001; John 2015). Triangulation of sources and verification of themes were used to provide credibility to the findings (Marshall and Rossman 2011). Although all interviews provided valuable insights and context to understanding gender roles in the community and the contribution by Heiltsuk women to the process of transforming fisheries governance, only certain interviews, and mainly those by women, are highlighted here. This project was developed with the consent and ongoing input from the Heiltsuk Nation (i.e., from the Heiltsuk Integrated Management Department, the Heiltsuk Tribal Council, and the women and men who participated in this study). While the primary author is a non-indigenous scholar, the analysis was done with extensive input from Heiltsuk collaborators and co-authors. Ethics protocols were followed throughout this research, including those set forth by the Heiltsuk Nation, the University of British Columbia, and Simon Fraser University. The direct naming of participants was done out of respect and as the preferred citation method by the community, supported by the Heiltsuk and University ethics boards. The role of Heiltsuk women in the process of transforming fisheries governance and in challenging the current system, which continues to marginalize Indigenous peoples with respect to fisheries and all other aspects of their social, economic, and cultural systems, is significant. Shifts in ecological regimes (e.g., fluctuations in herring abundance), institutional processes (i.e., Supreme Court system, litigation, protests), and economic realities (high unemployment, etc.) together created an important window of opportunity for change. The ability of the community to seize this opportunity, effectively mobilize, and set up the preconditions for a transformation in governance relied heavily on the contributions by Heiltsuk women during this conflict. Women brought strength and cohesion to this struggle over herring by calling upon both traditional and contemporary roles and responsibilities as mothers, teachers, community and domestic managers, and political leaders in defense of their children, culture, and future generations. In the following sections, we describe these contributions, which acted to strengthen the community and catalyze change. “When the lock-down was finished, it was the women who did a lot of the negotiations outside, we were the ones that made sure everyone was fed, we were the ones who made sure there was transportation, the men were the warriors, they were there, ready, but the practical work of making it happen, it was evident that it was driven mostly by the women.” (Hilistis Pauline Waterfall, May 23, 2017). Adding to this, Chief Marilyn Slett reflects on the success of the demonstrations and lock-down, attributing it to, “a lot of strong women leadership, grassroots leadership, mobilizing people and helping to keep the pressure on DFO [the federal fisheries agency].” (May 31, 2017). Together, these quotes highlight some of women’s gendered roles around community organizing, coordinating, and informal leadership, which although often ascribed a lower value in society, are associated with status and prestige in some Indigenous contexts (Udel 2001). In this case, these gendered roles provided strength to the struggle over herring and were essential to establishing the preconditions for transforming governance, by leveraging social networks and building momentum (Olsson et al. 2006; Moore et al. 2014; Table 1). Using Westley et al.’s (2013) terminology, it was through institutional entrepreneurship that these key actors (many of whom were women) caused a system-level disturbance which opened a window of opportunity to push forward the Heiltsuk agenda for transforming fisheries governance. Stand-off on water between two Heiltsuk women and commercial seine boat; occupation/lock-down of federal fisheries agency office by female elected Chief. A group of women and youth draft and deliver letter to federal fisheries office, communicate across groups and organize meetings. Heiltsuk women on the frontlines of demonstrations at industry and government offices in city centers, coordinating and connecting through social media. Women call on roles as domestic and community managers to coordinate demonstration-related logistics (i.e., safety plan, transportation). Key women in the community work together, leveraging roles as teachers and transmitters of culture, engaging Heiltsuk youth with the herring song to diffuse tension and build a common vision. Female elected Chief effectively negotiates with federal fisheries managers on behalf of male hereditary Chiefs, emphasizing collaboration and peace. Women teach herring song to Heiltsuk youth; Heiltsuk women, youth, and elders paddle over to federal fisheries agency office to issue eviction notice. “It’s about much more than a specific resource but also how that resource gives you a window into everything that is important to the community in terms of values and working together and moving forward sustainably. I was 8 ½ months pregnant when I was at the occupation camp and that so firmly rooted me in the understanding that I was there watching the leaders through the window in this really difficult negotiation and feeling my baby kicking in my belly and being surrounded by so many generations who were rising up with so much joy and love in the face of such great, dismal challenge. I think that really illuminated for me all that’s strong in the community and all the hope for transformation that exists that is so much more than just fish.” (Jess Housty, February 23, 2016). These reflections echo accounts of Indigenous women in other contexts who have been at the forefront of resistance movements related to natural resource conflicts, motivated by their roles as caretakers of their children and grandchildren, and as transmitters of culture (Kuokkanen 2011). Here, these responsibilities as mothers and caretakers were also powerful motivators for action, in this case to ensure the survival of a species that is crucial to Heiltsuk identity and wellbeing. “When the herring was at risk again of being depleted with a threatened commercial opening, it was Marilyn [Chief Slett] who really, in her role as an elected leader, stepped in, with Kelly Brown and Frank Brown and others, and just took it upon herself to fulfill her role and making sure she did what was needed to state our case about protecting the sustainability of our herring species. And although it was difficult for her, I was able to support her. We weren’t allowed in because it was a lock-down, but we were able to speak to her through the window. The chiefs [male hereditary Chiefs] were really good about going over and saying this is really good work, just continue doing it, we support you and Kelly” (May 23, 2017). As parallel efforts took place and tensions mounted at government offices in Vancouver, Chief Marilyn Slett advised those on the frontlines of their commitment to peaceful protests. The link between the strong presence of women at these demonstrations and the success of these actions in setting up the conditions for a transformation is supported by literature that relates participation by women in collective action and resource management to increases in collaboration, solidarity, and conflict resolution (Westermann et al. 2005; Pandolfelli et al. 2008). Heiltsuk creation stories refer to women as peacemakers, and as being responsible for intertribal alliances (Brown and Brown 2009), and these characteristics appear very prominently in the contemporary leadership style of the women involved in this conflict. 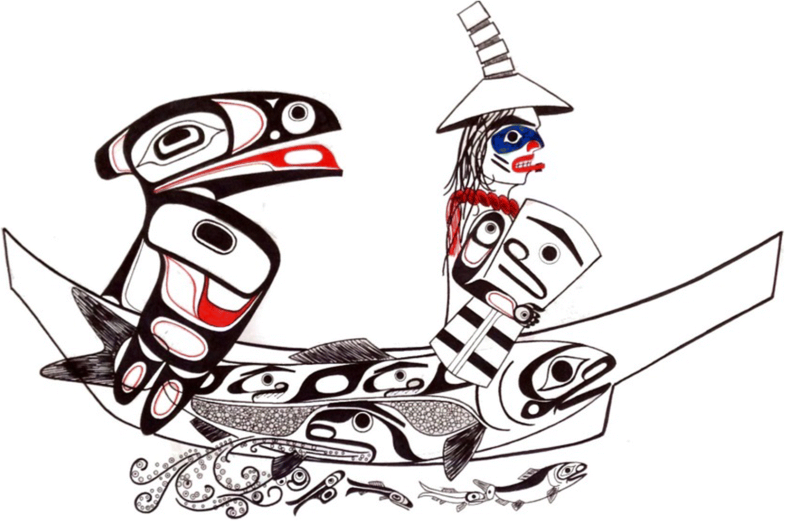 A crest commissioned by the Heiltsuk Tribal Council highlights both the formal and informal leadership of women in the herring conflict, and their role in supporting, inspiring, and bringing strength to this struggle (Fig. 1). Women’s gendered identities, as mothers and caregivers, can depoliticize their perceived role in resource and environmental conflicts, strengthening their ability to mobilize and create change (Pardo 1990; Udel 2001). Throughout the herring conflict, key women in the community worked together, leveraged their roles as teachers and transmitters of culture, engaging Heiltsuk youth with the herring song to diffuse tension and build a common vision. “The herring song had a huge impact, a rippling effect, generated a huge movement, and I could literally feel it with all these kids, in the morning all these chairs were filled, voluntarily” (Fran Brown, March 21, 2015). For a Nation that suffered huge losses of language and identity from the damages of colonial policies, being able to learn and sing about traditional food gathering in the Heiltsuk language brought a great sense of pride and self-identity, creating intergenerational connectivity. This song continues to be a source of community empowerment, illustrating the legacy of this vehicle and emblem of social cohesion and strength that remains long after the initial conflict. “Language is part of who we really are, it connects us to the land, to the sea, and to our resources” (Fran Brown, May 21, 2015). To the herring conflict, this song provided support and strength to those directly engaged in negotiations with state officials. Its collective voice generated the momentum needed to move from crisis and conflict to cooperative conversations with federal fisheries managers about change in fisheries governance. Louisa Housty worked with Fran Brown to bring the children to events and community meetings to break the tension and to bring positive energy through the youth, representing Heiltsuk’s future. In understanding transformation within linked social-ecological systems, this is a powerful example of institutional entrepreneurship, where key women in the community worked together, leveraged their roles as teachers and transmitters of culture, engaging with the intergenerational transfer of traditional knowledge, to build a common vision among the Heiltsuk (Table 1). This song was instrumental in mobilizing the social and cultural capital necessary for transforming this linked social-ecological system. The actions taken by women during the herring crisis and conflict highlight both traditional and contemporary leadership roles of women in Heiltsuk society. Several participants shared that traditionally, women in Heiltsuk society always had a role in decision-making, as advisors to Chiefs who were typically male (Waterfall 1993). Each hereditary Chief had an advisor who was not born into a chieftainship lineage. This was to assure the voices of all people were expressed in advising the Chief. These advisors were either men or women. As Hilistis Pauline Waterfall (October 18, 2017) describes, “My great grandfather, Albert Humchitt’s advisor was a woman and it was said that he never hosted a fest or potlatch without her by his side to advise him”. Although women had decision-making power, these leadership roles were not always obvious or visible to outsiders. Numerous accounts from both men and women interviewed suggest that women’s roles and responsibilities were valued and important, that shared responsibility was the norm, and that there was a sense of gender equality around decision-making. Although power asymmetries existed in Heiltsuk society along the lines of kinship and other factors differentiating people within the community, some of which continue to exist today, a gender balance of power seems to be a characteristic of traditional Heiltsuk society, even if specific roles were differentiated. While men and women made distinctly gendered contributions to the community and in politics (e.g., men went out to hunt and fish while women attended to domestic and community affairs; men as Chiefs and women advising them), these were perceived as complimentary (Pauline Waterfall, May 23, 2017; Jess Housty, February 23, 2016). Furthermore, gendered roles were somewhat interchangeable as people responded to daily needs and adapted to ensure survival (Waterfall 1993). Tsosie (2010) highlights this characteristic as a common feature of gender dynamics across a variety of Indigenous contexts where women have transcended gender roles in leadership and other activities in response to changing conditions. While a balance of power between men and women may have been the traditional norm, colonialism disrupted the traditional governance system of Chiefs and the women who advised them, which contributed to gender inequalities (Pauline Waterfall, May 23, 2017). Despite this disruption, Heiltsuk women found ways to continue their political influence. For example, Kelly Brown (November 1, 2017) describes his mother, Elizabeth Brown and grandmother, Brenda Campbell, who continued to advise the head Chiefs of the time and worked to establish the Native Sisterhood of British Columbia (c.1933), which supported advocacy around Indigenous fishing rights and the wellbeing of Indigenous fishing communities across the province of British Columbia. Today, there is strong representation of Heiltsuk women in elected political leadership; a situation that is not the case for many Indigenous communities across Canada where the elected leadership is dominated by men (Sayers et al. 2001). Indeed, in many contexts, the traditional role of women in collective decision-making was undermined by colonial policies that displaced Indigenous women from their communities and from leadership positions (John 2015). For the Heiltsuk, there is a strong tradition of women’s involvement in collective decision-making, and, as the socio-political context continues to evolve, women are reaffirming their place in society, drawing strength from traditional roles and responsibilities, to protect herring and other resources in their traditional territories that are key to their cultural survival. As Indigenous peoples across Canada strive for self-determination, there are numerous examples of Indigenous women leading efforts, often at a grassroots level, for more equitable and inclusive policies related to food security, water, and, other natural resources, motivated by a sense of responsibility for the health and wellbeing of their families and communities and defenders of culture (Kuokkanen 2011; Palmater 2011; John 2015). Through the processes of reconciliation and self-determination, Indigenous women are reaffirming their traditional leadership and caregiving roles while also occupying new spaces within a changing socio-political landscape (Udel 2001; John 2015). However, more attention is needed to understand these gender dynamics, in order to support Indigenous communities, and especially Indigenous women, in efforts to transform governance and create more equitable policies in fisheries and beyond. We engage with the concept of positionality when considering fisheries governance transformations using the Heiltsuk-herring case study to highlight how Indigenous women responded in a recent resource conflict to catalyze change in fisheries governance. Our analysis demonstrates the importance of gender and indigeneity in considering governance transformations in social-ecological systems. This work underscores the value of strong participation by Indigenous women in fisheries governance and decision-making, as important stakeholders in this sector, to be certain, but also as powerful agents of change in their communities, bringing unique strengths to these processes, which deserve attention and further analysis. In recent efforts by the Heiltsuk to restore access to the valuable spawn-on-kelp fishery by protecting the herring stocks in their traditional territory, Heiltsuk women brought strength to this struggle by drawing on their traditional roles and responsibilities in the community and acting as important leaders in transforming fisheries governance. While the success of recent acts of self-determination hinged on the strength of the entire community, including Elders, men, women, and children, strong agency and entrepreneurship by Heiltsuk women brought the community together, creating intergenerational solidarity and movement towards change. The unified voice that emerged from the community during this fisheries management conflict prompted attention and action by federal policy makers, resulting in substantial progress towards further assertion of Indigenous resource rights. We see these movements not only as key for the fishery, or to reposition these women at the forefront of resource governance, or of their community, but also as key in broader processes of reconciliation. Even as Canada has made commitments to reconciliation, few examples exist of specific pathways that will enable movement in this regard, including models of effective co-governance of resources. The women involved in this conflict over the herring fishery promoted changes important to the long-term sustainability of the fishery, but also with heightened attention to intergenerational care, equity, and environmental justice, and as such, in ways that speak to broader agendas implicit in reconciliation. Making progress on Canada’s commitment to reconciliation will require transforming existing systems of power, including the gendered and racialized institutions and structures that have marginalized Indigenous peoples in Canada for far too long. For the reconciliation process to be meaningful, systems of governance need to change substantially to reflect a new relationship between Indigenous peoples and the state, where decision-making power is shared, and the voices of both Indigenous men and women are included and supported. Transforming fisheries from a colonial governance system to one oriented towards reconciliation, where equity and social justice are central features, is crucial to the survival of herring and the people who rely on them. In this paper, we use the term “Indigenous” to refer to all peoples who trace their ancestry to the original populations of Canada, except when referring to the Canadian legal context (e.g., Aboriginal fishing rights or licenses) or to a specific Indigenous group in Canada (e.g., the Heiltsuk Nation). “Indian Band” is a legal term used under Canada’s Indian Act to describe groups of status Indians. This term was used here in reference to the legislated access by Indigenous peoples to fisheries resources as delineated by Federal fisheries policy at the time. We are grateful for the guidance and support received from the Heiltsuk Integrated Resource Management Department on developing this project. This work would also not have been possible without the insights that were generously shared by Heiltsuk women and men over the course of this study. We would also like to thank all those who reviewed this paper and provided valuable feedback. This work was supported financially by the Social Sciences and Humanities Research Council of Canada through a Canadian Graduate Doctoral Scholarship to SH and the OceanCanada Partnership led by RS and through a Natural Sciences and Engineering Research Council of Canada Strategic Partnership Grant to AKS. The main author (SH) led this project from inception through to the analysis and writing of this manuscript. The second and third authors (AKS and DN) provided key guidance on developing this project and contributed significantly to the text while PW, KB, and LH made substantive intellectual contributions and RS provided analytic support and project oversight. All authors critically reviewed the text and agree with the analysis and conclusions. This project was developed with the consent and ongoing input from the Heiltsuk Nation (i.e., from the Heiltsuk Integrated Management Department, the Heiltsuk Tribal Council, and the women and men who participated in this study). Ethics protocols were followed throughout this research, including those set forth by the Heiltsuk Nation, the University of British Columbia, and Simon Fraser University.